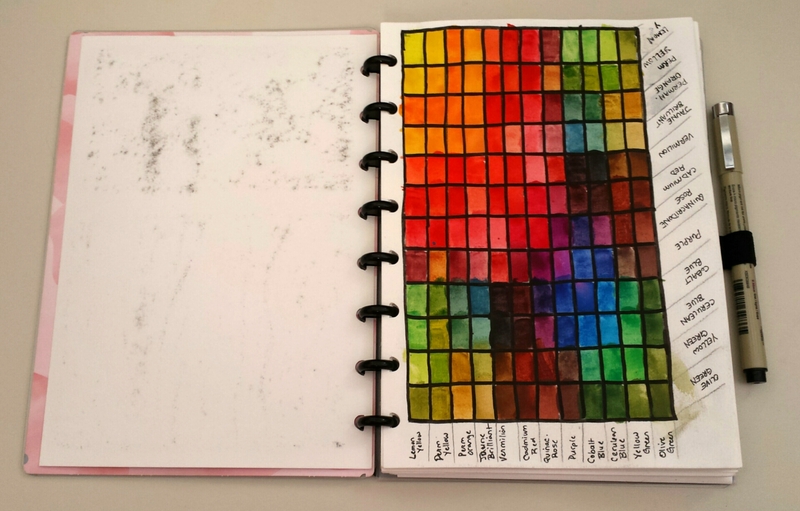 I posted back in October about creating a watercolor sketchbook in a discbound format, and thought ‘d show how it currently looks. 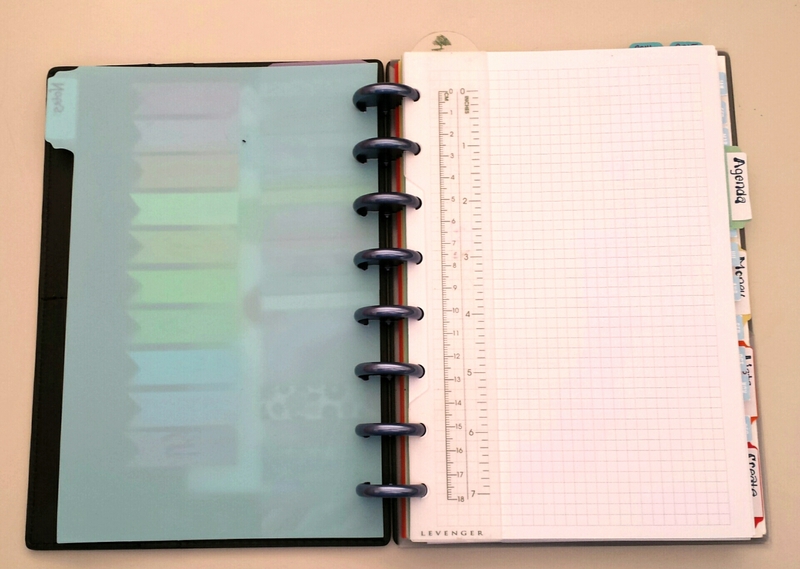 I’m still using clear plastic front and back covers as in my previous post, but in the interest of an even slimmer and more portable sketchbook, swapped out the pretty 3/4″ Spectra discs for the plain but smaller 1/2″ discs. I’ve added a matching black adhesive Leuctthurm1917 pen loop. The coversheet is from the now-defunct Office Depot Revolution brand notebooks. All in all, still very pleased with how it turned out, but now its even more purse-friendly! 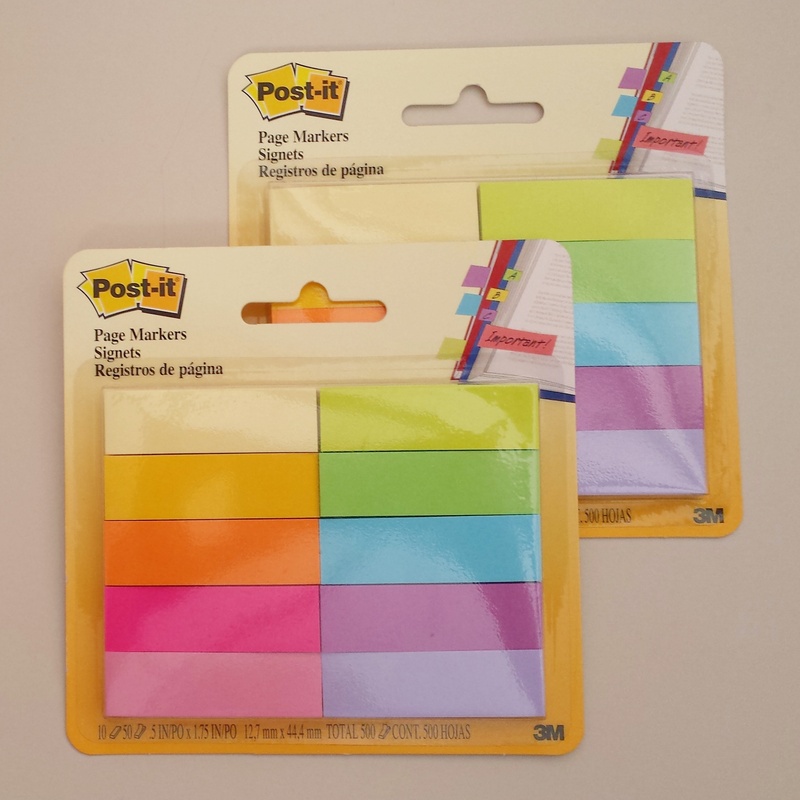 In my explorations online, I’d heard that Dollar Tree cutting mats, sold in sets of 2 per package, could easily be cut down into discbound notebook covers. 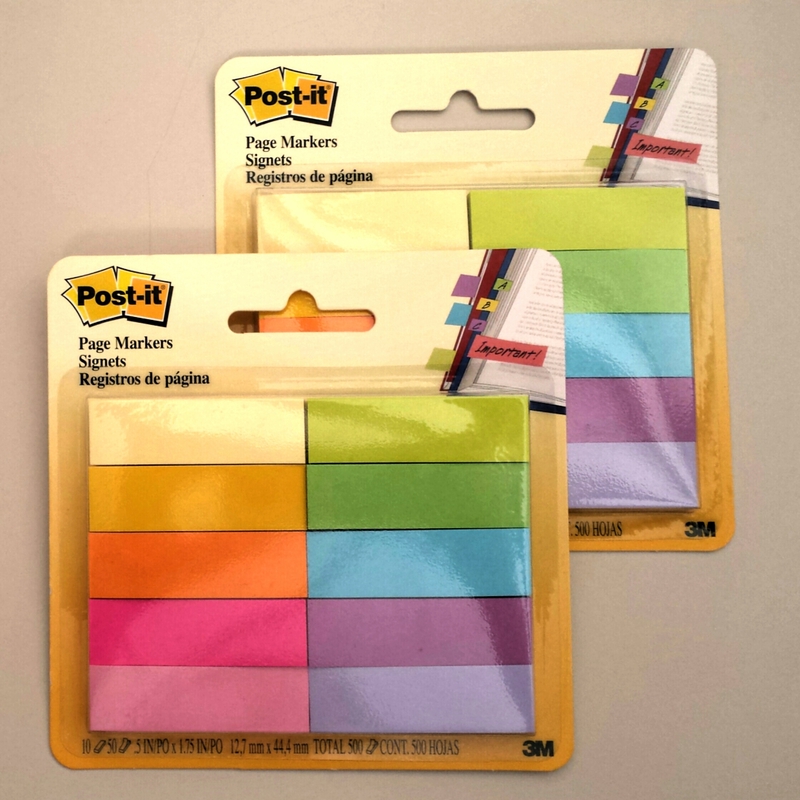 So once day I made a trip specifically to Dollar Tree to grab some, and recently had the chance to try it out. Here’s how the process went! First of all, I had to find a good template. 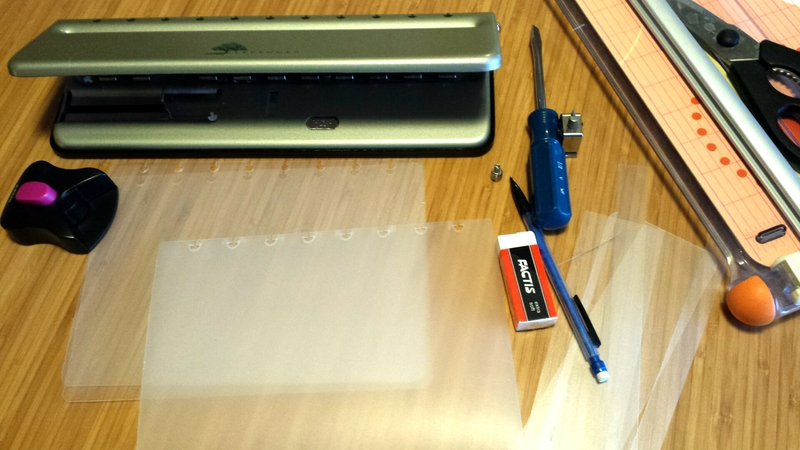 I used the clear covers from an Office Depot Foray Revolution notebook to trace my pattern onto the cutting mats. 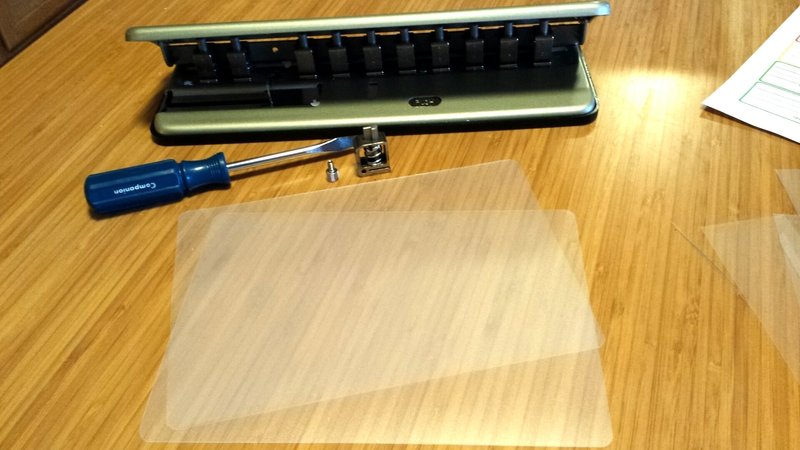 I was able to get both front and back pieces on one cutting mat, still leaving one leftover for future use. I penciled around the Foray cover, and cut them with a paper cutter, rounding the edges with a scrapbooking corner rounder I had. Once the pieces were ready, I matched up the new covers to the pre-punched Foray cover, and removed a punch head from the Levenger Circa punch for spacing reasons (easily done by unscrewing and sliding forward). 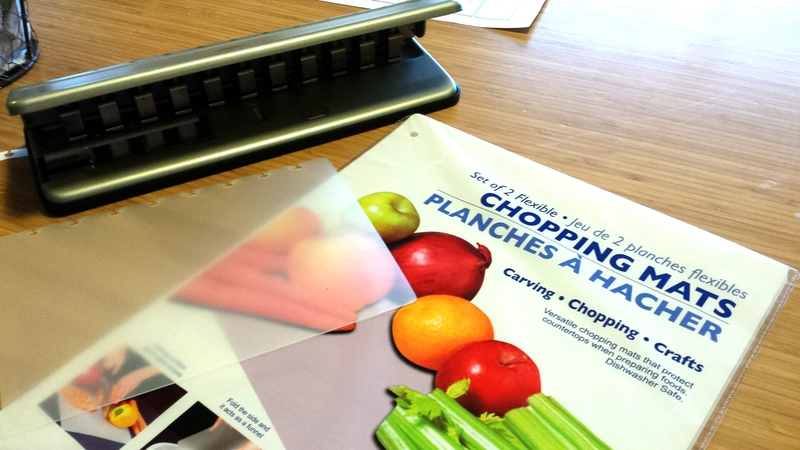 Of that one cutting mat, I had enough plastic for front and back pieces AND two pagefinders. The covers on an actual dashboard. One of the custom cut pagefinders I used to hold sticky flags. Another view of the pagefinder. Final results are, I really like them as covers, but the plastic is very thin and somewhat flimsy/floppy. 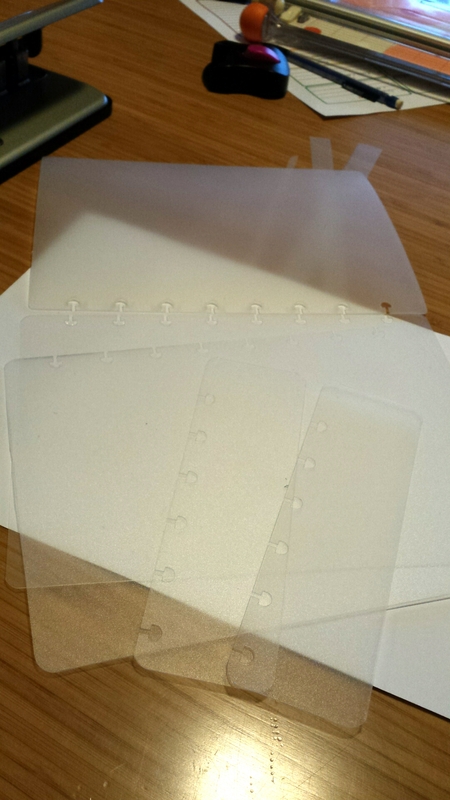 On a notebook without any tab dividers or other support, it can be little TOO thin compared to normal Staples Arc poly plastic covers. 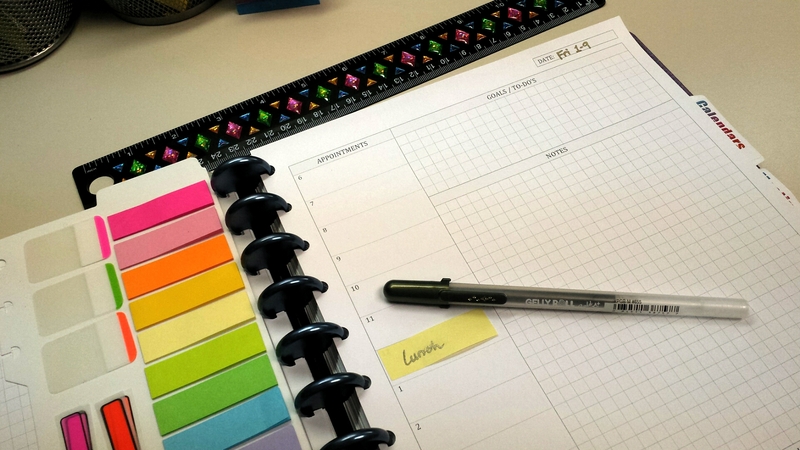 As I become more involved in online planner groups on Facebook and Instagram, I’ve also become more inspired to try and find the perfect weekly planner layout. 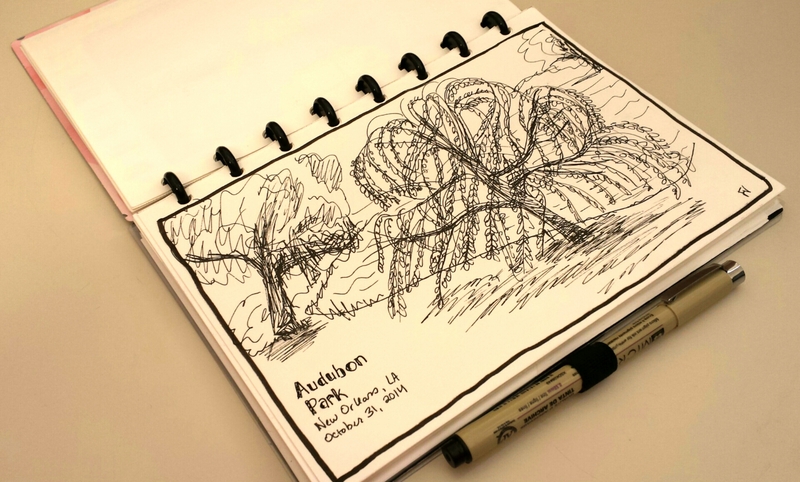 I was drawn to the whole planner ecosystems around the Erin Condren and Plum Paper planners. I like the weekly layouts, divided into day segments and with otherwise open boxes for people to write their own appts, reminders, etc. 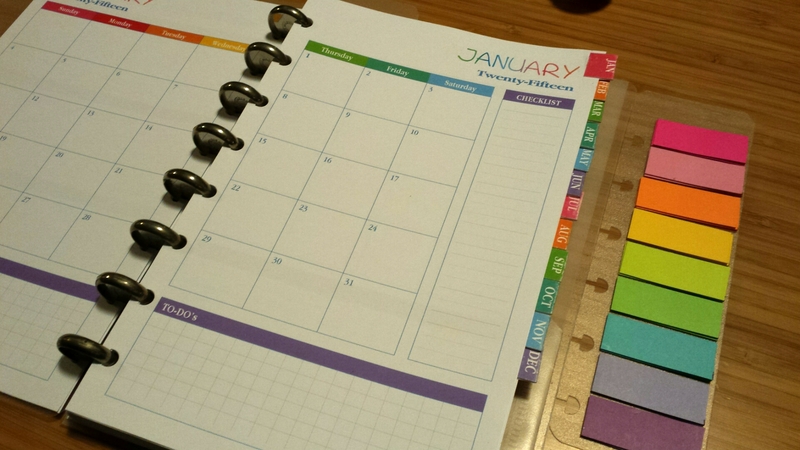 And who knew there are whole planner stickers and accessories designed to fit the boxes in these planners? Crazy, right?! 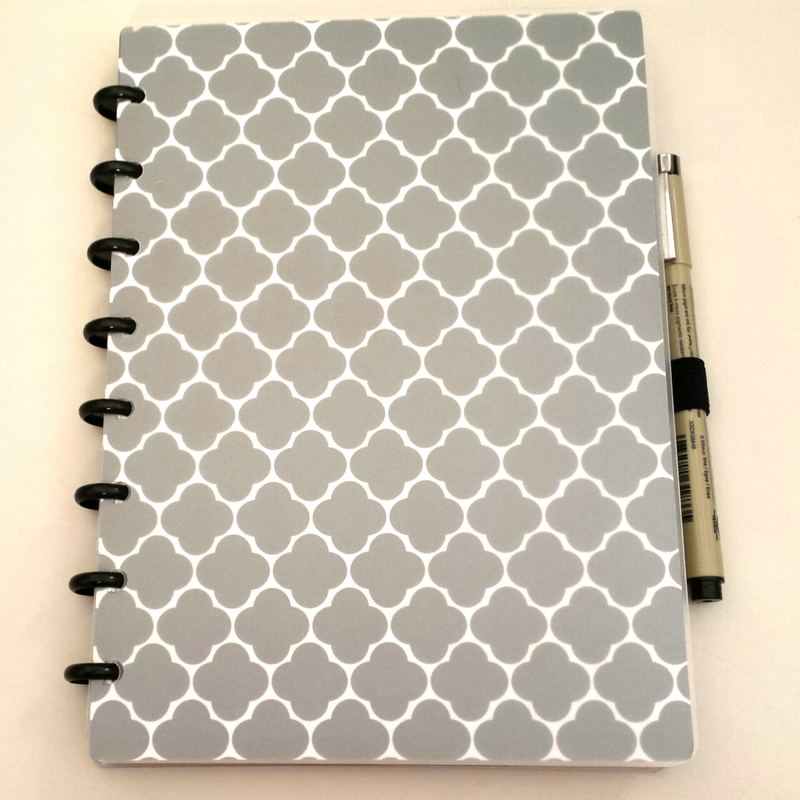 But as I browsed through the planner sections of Etsy, I so wanted to try them! 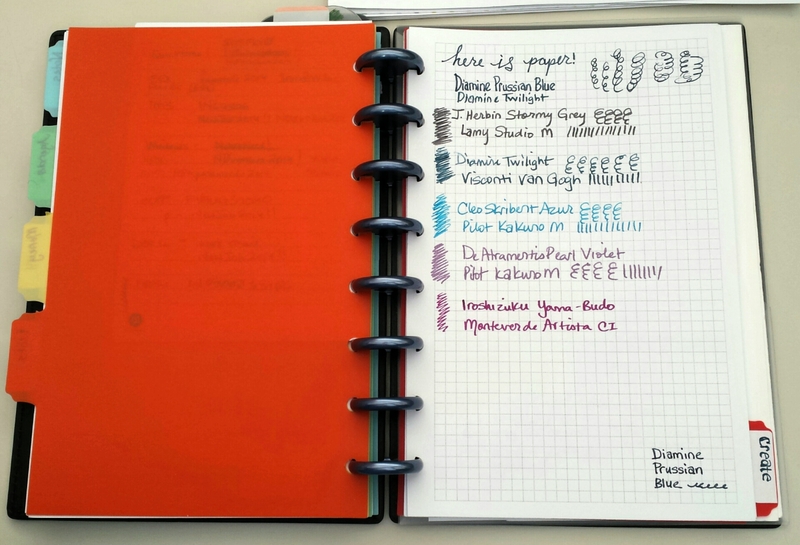 But … I like my discbound notebooks – the planners I linked to above are an unconventional size: too big for the traditional ‘Junior’ or 8.5 x 5.5″ sizes, and too small for Letter-sized notebooks. 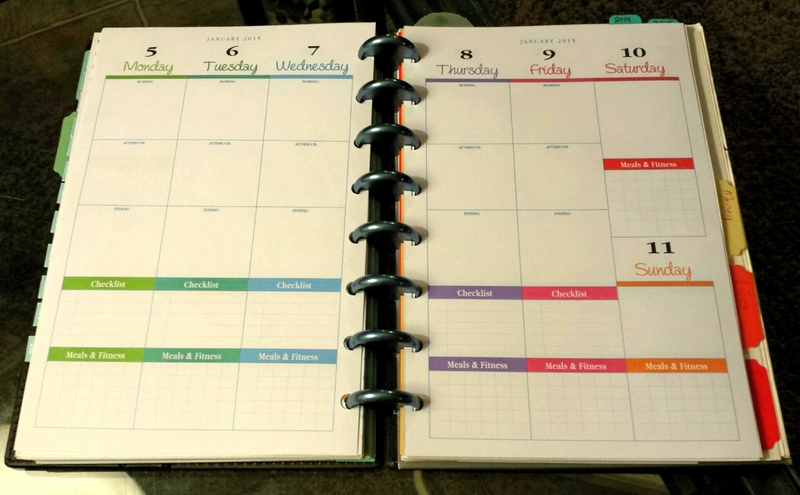 And they are THICK spiral-bound planners! While I’d seen pics from those who have cut off the spiral binding and punched them with Levenger punches, they’d still require some pretty big discs to carry the whole thing, which I don’t like to use as a general rule, 1″ is as big as I will go (and that took awhile!). 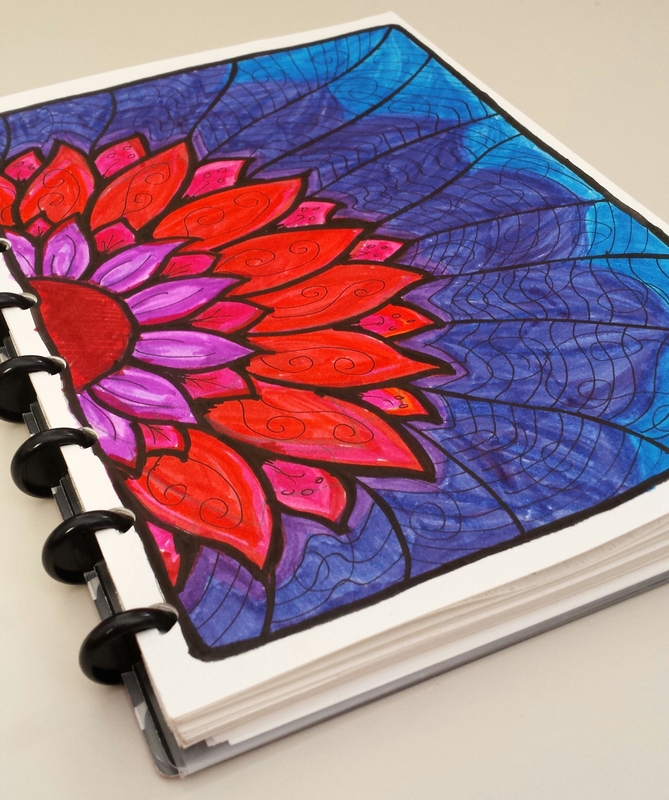 But after browsing Etsy and comparing alternatives, there didn’t seem to be any substitute planner printables that I could find that had a similar feel. 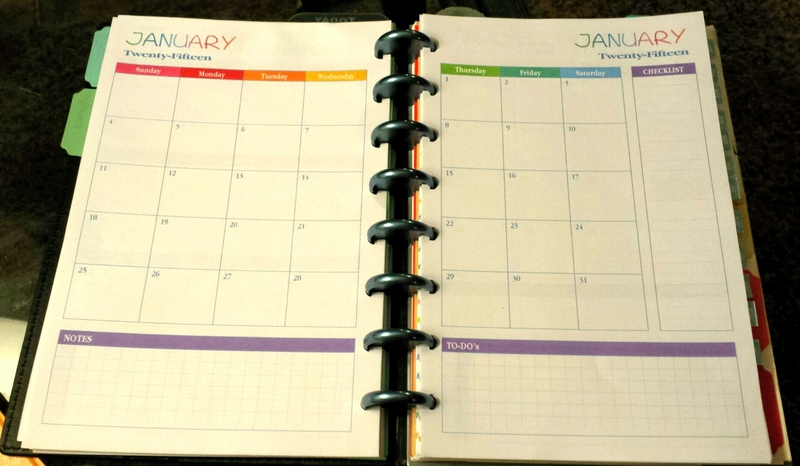 I call it the Pretty Pretty 2015 Planner. Because it is pretty. Best of all, it’s free for download! 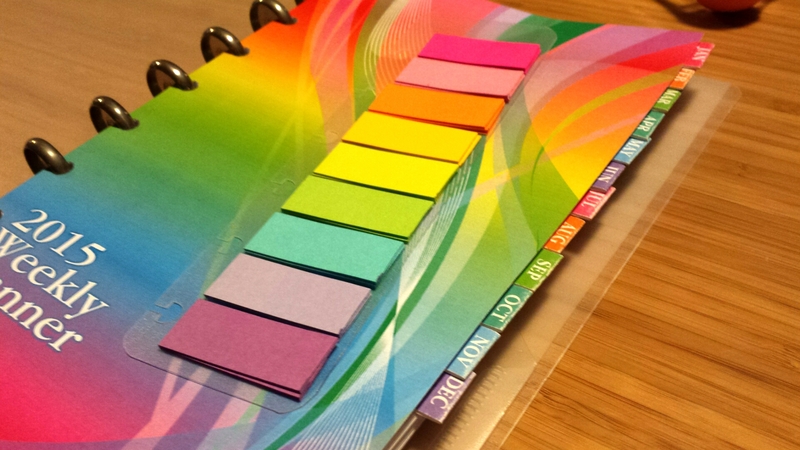 I really love the entire look and concept of this discbound planner from Jen at I Heart Organizing – from the colors down to the sticky tab labels and accessories. 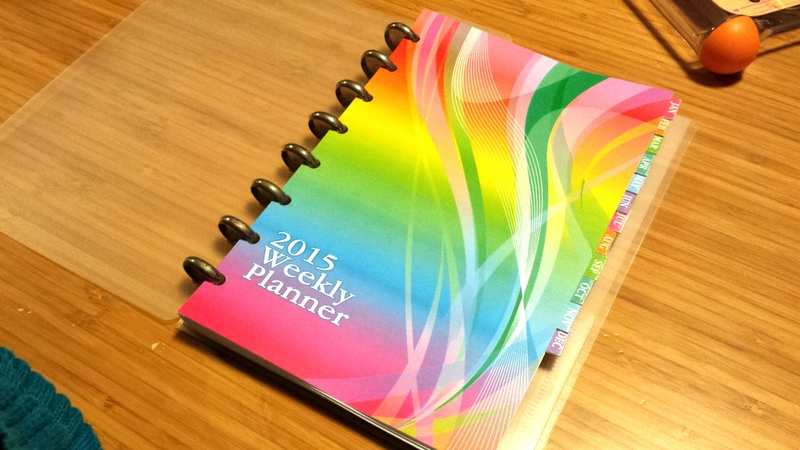 Lucky for us, the planner printables are available from her Etsy shop! 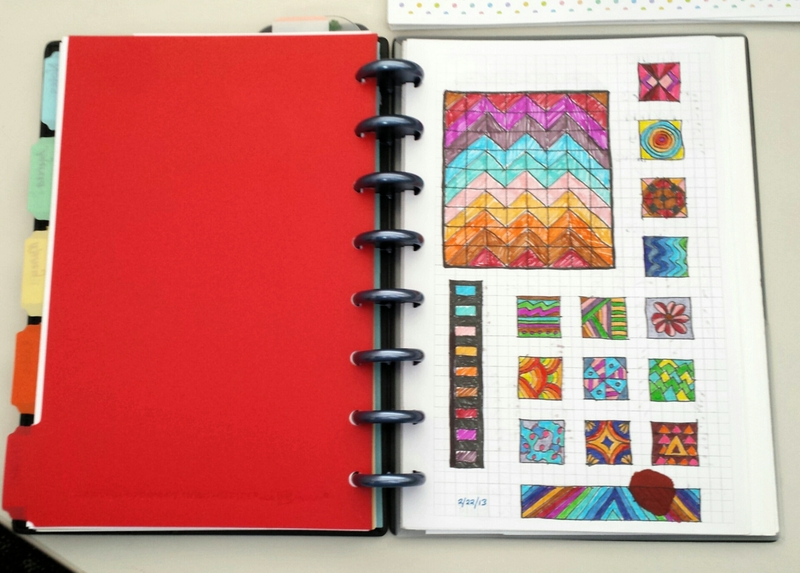 Was browsing through Pinterest when I found my way to MyHouseAndHome’s blog and her fantastic overview of her personal discbound planner. 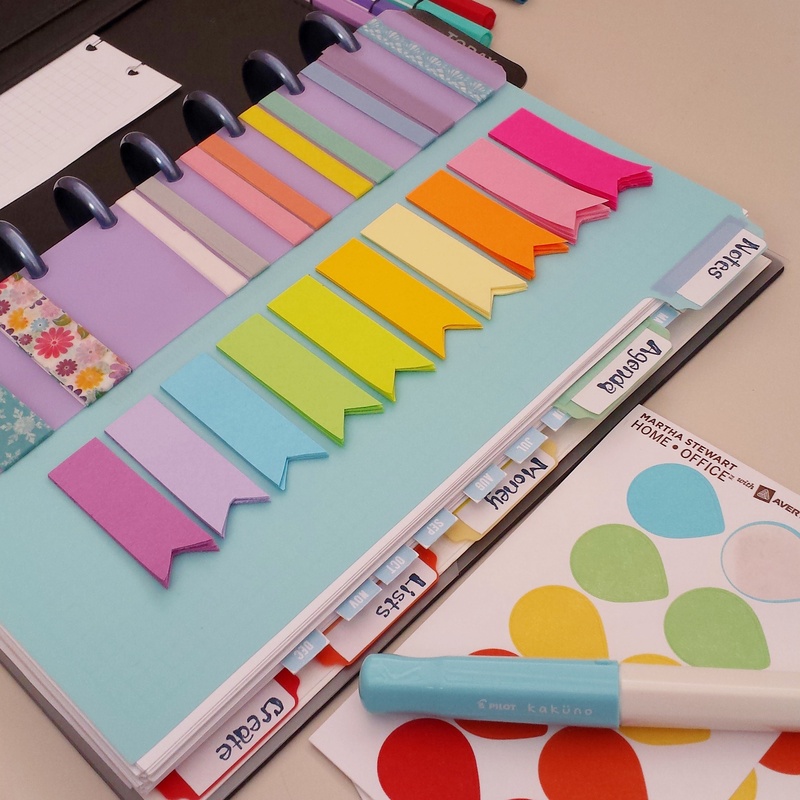 I really like the idea of creating tab dividers with cardstock, post-it flags, and washi tape – it’s ingenious! Definitely bookmarking for future reference. Well, since I shared my work notebook earlier this week, I thought I’d share my personal planner too. 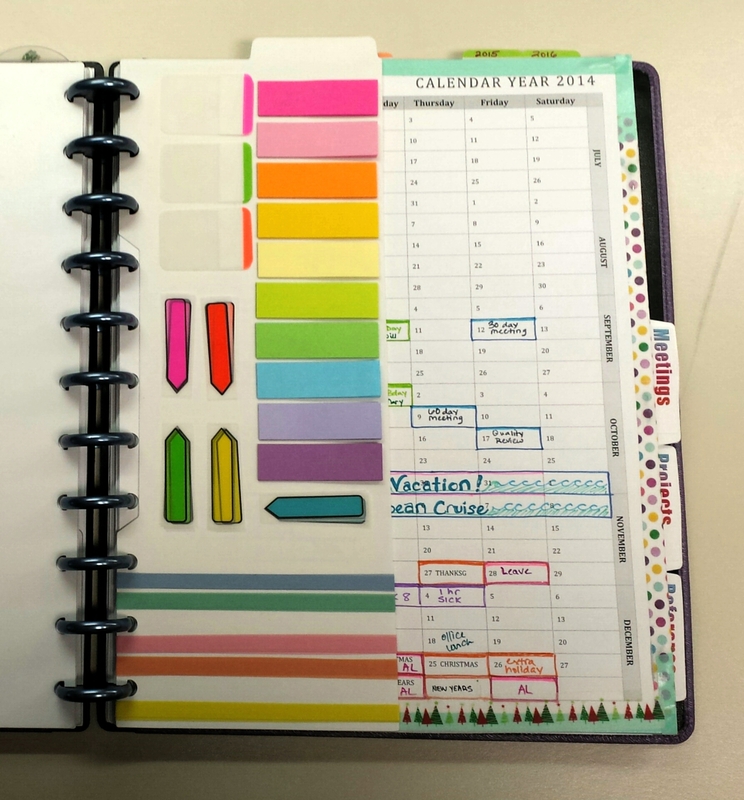 Ever since my “planner epiphany” about it being okay to have separate planners, I’ve been implementing a lot of ideas I’ve seen online and from planner groups I participate in. Whereas before, when using one notebook or the other, alternating between letter-size and junior-size, when I used one I always had this tiny bit of guilt for not using the other. And just had this block about the uses for two planners. But now that I’ve stopped trying to pigeonhole both work and personal planners into one notebook, both are getting used. And it’s working! It sounds so stupidly common sense you guys, but for me, it’s a whole new approach. So here’s a peek into what I have developed so far. and cut out the edges and stuck them to one of my plastic Martha Stewart Home Office by Avery tab dividers. The colors are just so darned PRETTY! But the flags started getting messed up by the cover pockets and sticking up funny. 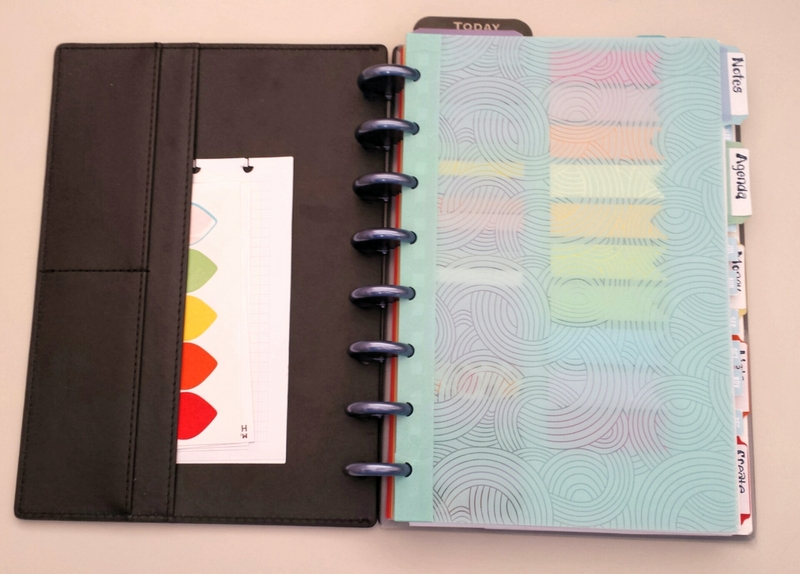 So I added a washi-taped cover (meaning I carefully removed the plastic cover from the wirebound notebook, bound the edges in washi tape, and punched it in my discbound punch) from a spiral-bound Martha Stewart Home Office by Avery notebook ($2 on clearance, love these sales!) as protection against getting caught in the pockets, and it serves as an extra semi-transparent dashboard surface too. 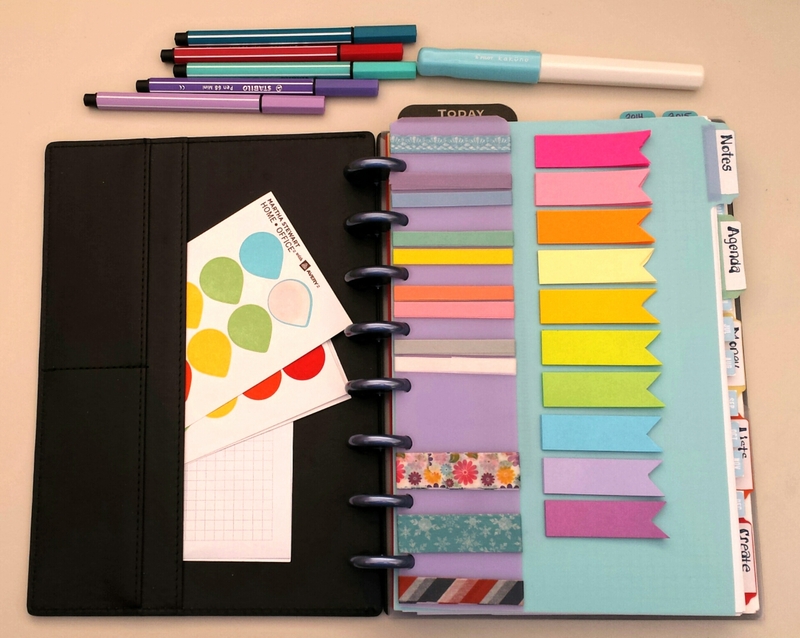 The first tab is for miscellaneous notes, to-dos, blank paper. Anything I jot down. The grid refill shown is my own creation, with grids on one side, dots on the other. It’s available under the “DIY Planner Templates” page. 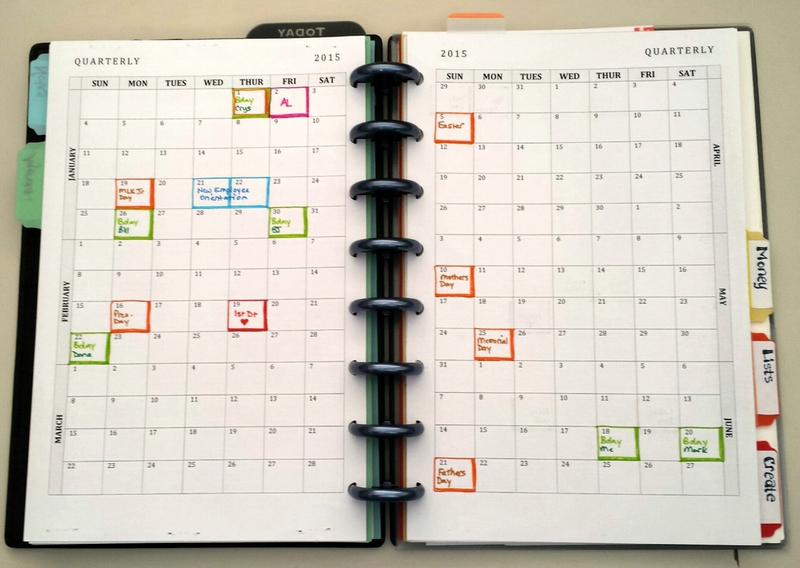 The Agenda section consists of three planning calendars. 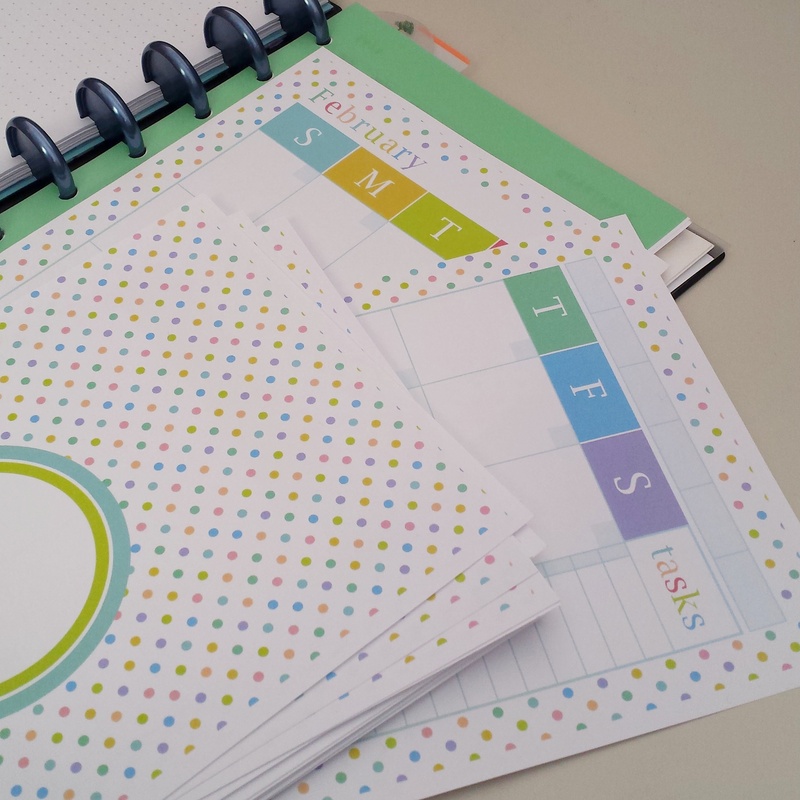 First, a set of undated monthly calendars from a set called the Polka Dot Planner by SpringHomePrintables on Etsy. I don’t mind undated, I’m OK with writing in dates. The polka dots didn’t quite extend to the edge of my paper either (stupid printer!) but I’m okay with that too. 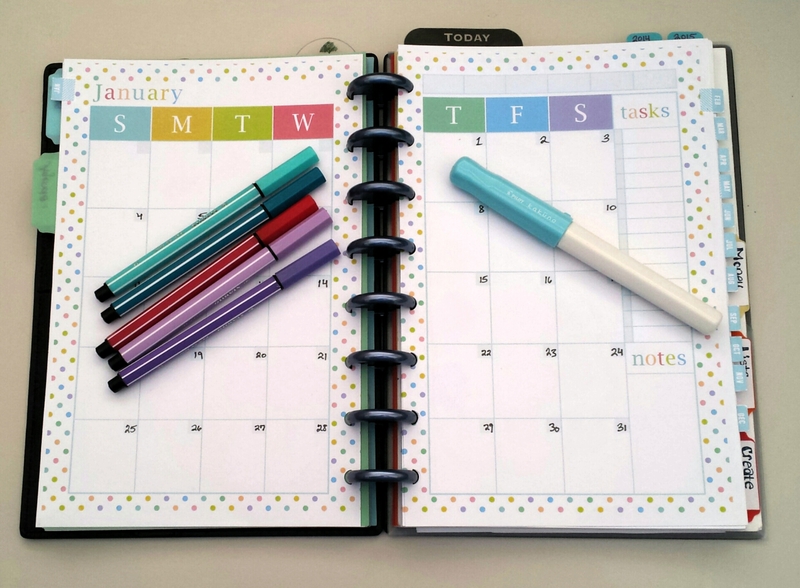 Trying out the Polka Dot Planner from SpringHomePrintables on Etsy. The pastel-colored boxes are really cute! It’s a little light for my taste text wise, but I’m liking it. 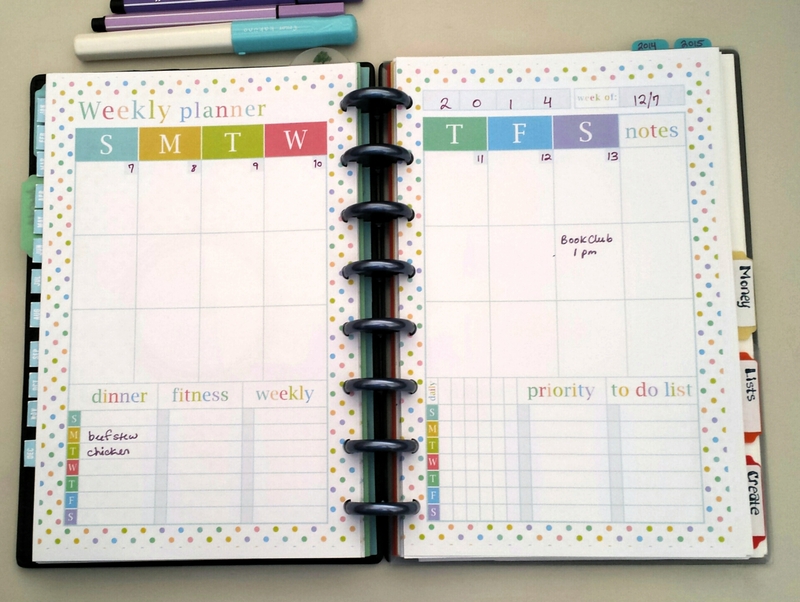 Next, also from the same Polka Dot Planner set, an undated weekly agenda. I liked the dinner and fitness tracking. It’s almost too cute really. Not sure what I’ll use the tracking boxes (right-side page, lower left-corner) for yet, but something will come to me eventually. Next section is called Money. Right now it’s just ruled paper I track my bills and finances on. If I find a good template I may add it here. Otherwise, nothing to see here so moving on to Lists, for lack of a better name. Here I’ll keep lists and reference items, pen ink samples, records of things I sell or ship, that kind of stuff. Basically my file cabinet. Finally, the last section I just call “create”. 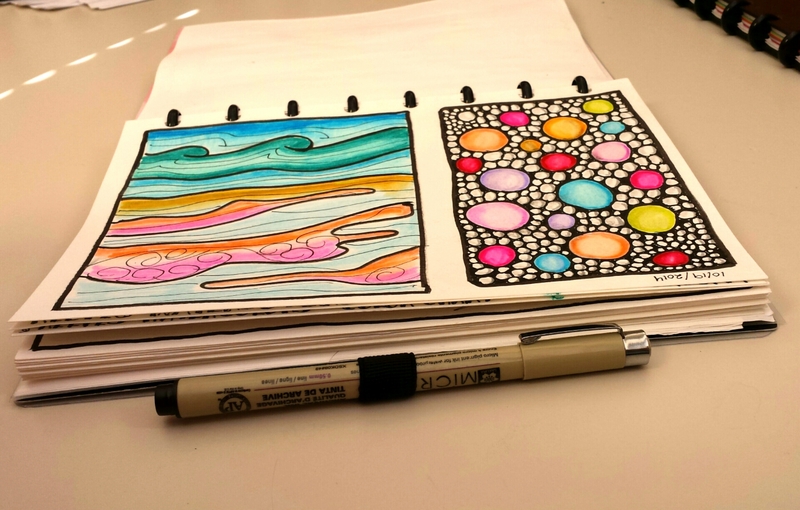 Here I’ll keep doodles, sketches, etc and have blank watercolor paper. Behind this slightly oversized watercolor paper (that’s why it’s in the very back) is a Martha Stewart discbound pocket divider. So that’s it! My planner so far. I am looking forward to seeing what else I can do with it.